Anti-eviction activist-turned-mayor Ada Colau faces a difficult challenge in Spain’s second city, following two arrests and 33 injured in three nights of riots in Barcelona’s Gracia neighborhood by supporters of an okupa squatters collective that had peacefully occupied a vacant bank branch office since 2011 — until Colau’s administration stopped paying the rent and the property’s new owner filed for eviction. With Catalonia’s Mossos d’Esquadra police force having welded shut the bank branch entrance with steel plates to prevent a re-occupation of the property, Colau said the okupas are refusing to negotiate with her representatives as she called on local Gracia neighborhood organisations to step in and attempt to mediate with the situation in order to find a suitable new venue for the collective in Gracia. 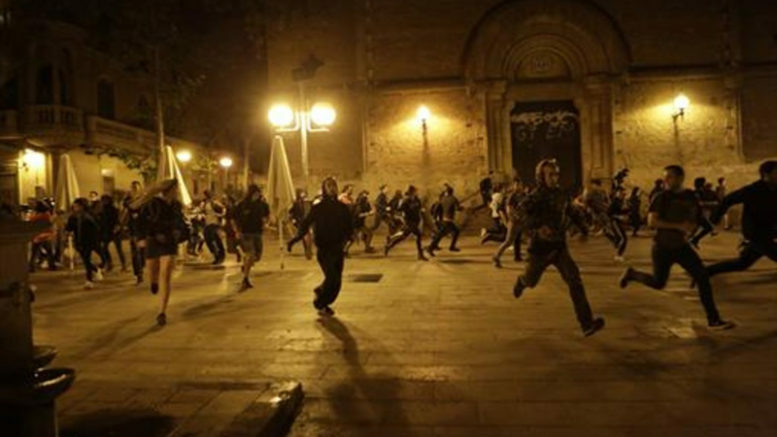 Former Barcelona mayor Xavier Trias of the conservative Convergència Democràtica de Catalunya (CDC) party says that unbeknownst to the okupas themselves, his administration paid 5,500 euros monthly rent to the former bank owner from 2011 through last year to avoid a violent confrontation between okupas and police. After Colau’s administration stopped paying the rent, the new owner filed for eviction and police moved in Monday to rout the squatter collective.